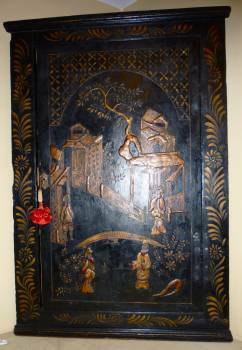 Chinoiserie scene with gilt figures in a garden enclosed by a fence, a tree & buildings beyond. The top of the door with a gilt arch below a trellis pattern. Bordered by a flowers & leaves. Original lock & shaped, chased strap hinges. Two interior shelves. H: 40" W: 26 1/2"